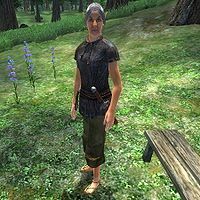 Anedhel is a Bosmer witch who is a devout worshipper of the Daedric prince Clavicus Vile. She can be found with her fellow worshippers, Ma'Raska and Gul gro-Burbog, at the Clavicus Vile's Shrine. Anedhel lives her entire life in the sphere of Clavicus Vile and never leaves the shrine, nor does she eat or sleep. She divides her time between wandering around or by sitting on one of the two available benches. She wears a common lower clothing which consists of a sack cloth shirt, sack cloth pants and a pair of sack cloth sandals. She also carries an iron dagger along with a small amount of gold. She knows a leveled set of witch's spells as well as extra major destruction and mysticism spells. When she greets you, she'll say, a bit brainwashed, "I played Lord Vile's game, and lost my soul. Small loss, I think." This page was last modified on 20 October 2015, at 05:15.